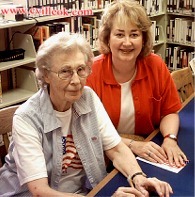 In honor of the 60th anniversary of D-Day, June 6, 1944, the day the Allies invaded Europe in World War II, the Collinsville Library will feature a display including vehicles, uniforms, books, magazines and other memorabilia from the 1940s. Plus, enjoy cookies, coffee and soft drinks, and participate in an Ike Look-alike Contest. 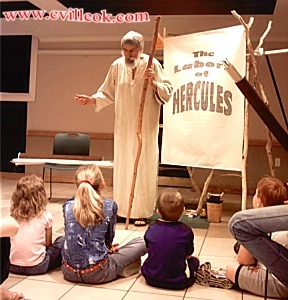 "Hercules" visited the Collinsville Library May 26th, 2004. 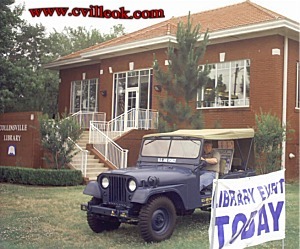 Some of the participants at the Library June 4th were -- Top Photo: Johnny Butts parks his 1952 Air Force Jeep on the Library lawn display. 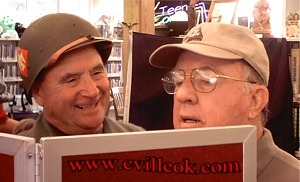 Middle Photo: Walt Cassady (from Tulsa in his Korean War uniform) and Johnny Butts look at photos. Bottom Photo: Peggy Henshall (accompanied by her daughter Linda Wilson) jots notes on her days as a riveter during WWII. On July 29th Collinsville received a call from The GEM Group that Collinsville was one of five National Grand Prize winners. The Grand Prize is a $1,000 grant. The main event took place at the on the grounds of the Library on June 4. They were busting out all over with visitors from Tulsa, Owasso, Oologah and other surrounding towns. They had children climbing through jeeps as military personnel explained the purpose of the different gadgets and camouflage nets. Children of all ages were able to meet the people who made our way of life possible. They were able to say thank you and salute those involved in a very important day in our history. The Collinsville Librarians created a scrapbook including the pictures they took to showcase their activities and the written essay explaining how they honored our Military. Susan Babbitt (CV) has a copy of the essay and the scrapbook if you would like to see it. Kudos to the Collinsville staff!